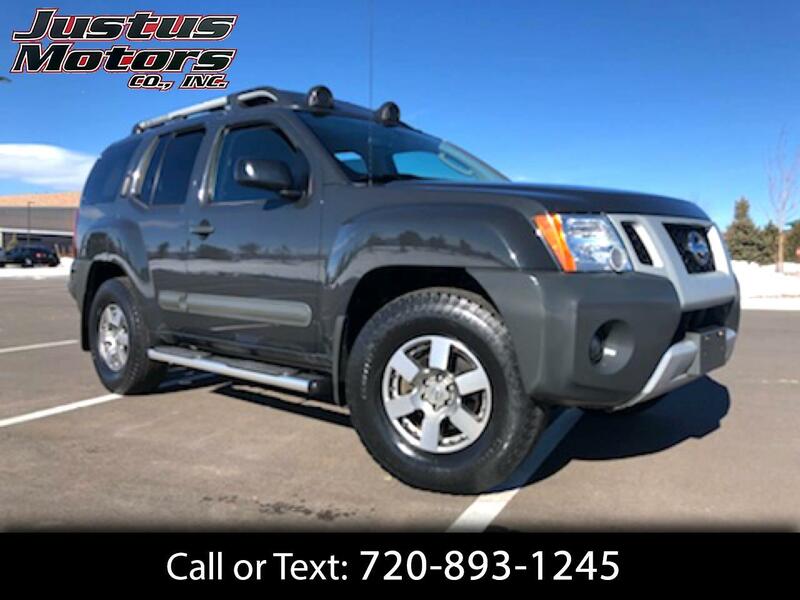 Used 2012 Nissan Xterra Pro-4X 4WD for Sale in Littleton CO 80120 Justus Motors Co. Inc.
Clean Carfax!! Financing Options Available!! Call or Text Us Today 720-893-1245! Our iconic 2012 Nissan Xterra PRO-4X 4x4 offers rugged good looks and incredible capability. The 261hp 4.0 Liter V6 is paired with a 5 Speed Automatic to score near 20mpg on the open road. Outside, you will find Bilstein off-road shock absorbers, roof rack w/off road lights and rear bumper step. The interior is designed to be ruggedly handsome, functional and durable. Power door locks and windows, cruise control, remote key-less entry and removable rear seat cushions are just a few of the standard goodies you'll enjoy. A Rockford Fosgate AM/FM/CD audio system and heated leather seats will make your drive, whether on or off road, even more enjoyable. Six airbags, vehicle dynamic control, a traction control system and a tire pressure monitoring system are all designed to keep you out of harm's way. Now's the time to drive an SUV that can handle your active lifestyle! Print this page and call us Now... We Know You Will Enjoy Your Test Drive Towards Ownership! Clean Carfax Reporting 14 Service History Records!! Call or Text Us Today 720-893-1245!! Financing Options Available with Approved Credit! !